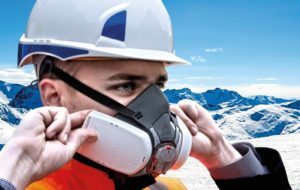 Many workers have to wear tight-fitting respiratory protective equipment (RPE) as part of their employment and it is a legal requirement that these workers be face-fit-tested by a competent person. It is therefore worth knowing what your responsibilities are as an employer with regard to fitting and maintaining RPE equipment for your employees. Here at JB Contract Services, we are trained in face-fit-testing and can provide an on-site service as well as staff training for your employees to carry out face-fit testing internally. How often do face-fit tests have to take place? COSHH ACoP L5 Dec 2013 states: “Tight-fitting RPE (i.e. full and half masks) should be face-fit tested, using a suitable method, by a competent person (see regulation 7 of the MHSW Regulations and regulation 12(4) of COSHH). Carry out monthly testing for frequent use, or every three months if used less frequently. Record your RPE examinations, tests and repairs for a least 5 years. Test the quality of air at least once every three months. It is therefore worth sitting down with any affected employees and asking them to think about if changing their facial hair would better protect them at work. What happens in a face-fit test? The face-piece fit test is a method of checking that a tight-fitting face-piece matches the wearer’s facial features and seals adequately to their face. There are two face-fit testing methods that can be used – either quantitative or qualitative. Whichever one is chosen, it must be conducted with the same exercises and conditions and with a competent, trained person in face-fit testing. The qualitative fit test will be given on a pass/fail basis and is based on the assessment of any leakage from the face seal region by the mask-wearer sensing the introduction of a test agent. These tests are suitable for half masks, not for full face masks. The quantitative face-fit test provides a numerical measure of the fit, which is known as a ‘fit factor’. The test requires specialised equipment and is more complicated to carry out than qualitative methods. Quantitative methods are suitable for both full and half face masks. What about mask maintenance records? observing battery charge and flow rate for powered devices. If you require any of these services for your company, or would like a bit more information, then please contact us today, and we would be happy to discuss your requirements.